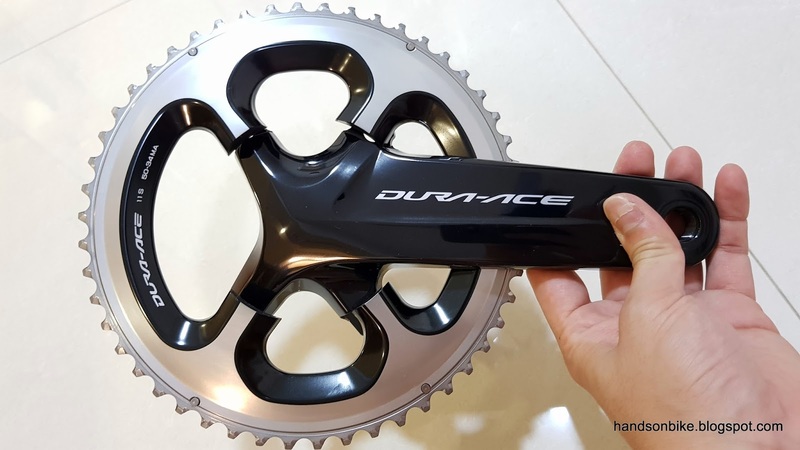 With the new Dura-Ace R9100 crankset, it retains the iconic 4 arm design that was first introduced in Dura-Ace 9000. When the 4 arm design was first introduced in 2013, I did not really like it as I still preferred the 5 arm design. 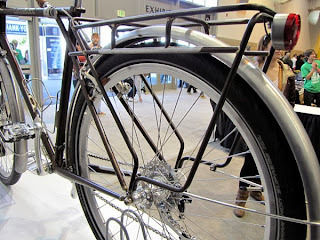 However, over these few years the design has become much more common, even in other brands such as FSA or Campagnolo. I have now gotten used to seeing this design and it now looks fine. 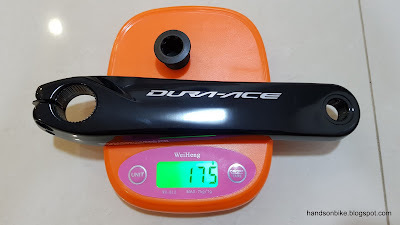 On the Canyon Endurace, I have decided to change the groupset from Ultegra 6870 hydraulic Di2 to the latest Dura-Ace R9170 hydraulic Di2 groupset. With that, all the components will be changed, in order to maintain a full Dura-Ace groupset. As highlighted in another post, the new Dura-Ace R9100 has some distinctive features that is new. 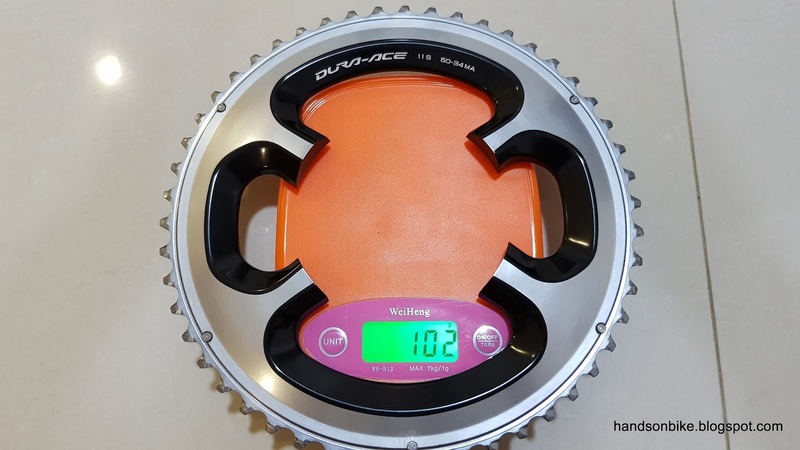 However, it is mostly similar to the previous Dura-Ace 9000 crankset. 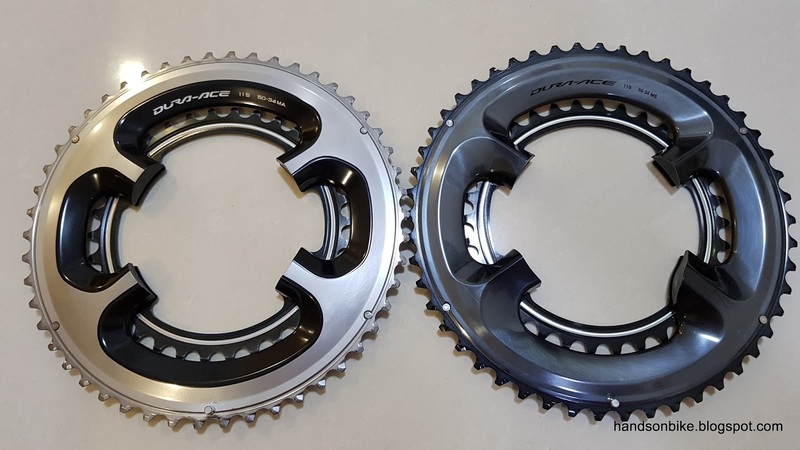 Let's take a closer look and make a comparison between these two cranksets. 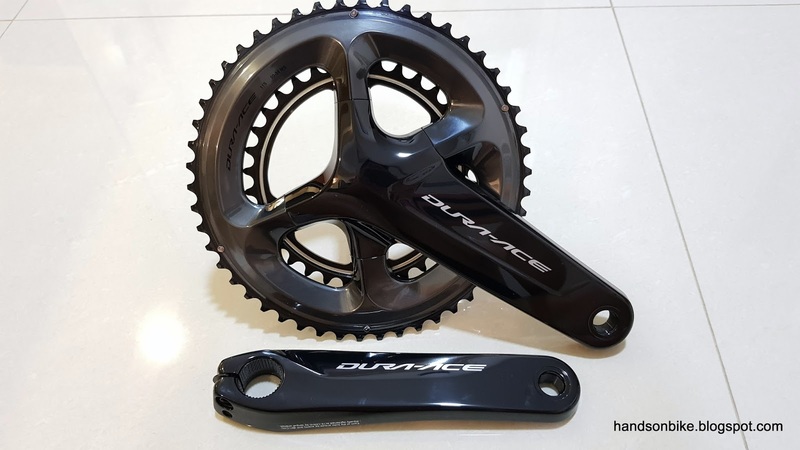 Dura-Ace 9000 crankset, with the silver and black anodized series colour. New Dura-Ace R9100 crankset is mostly black, fading out to grey at the edges of the chainring. 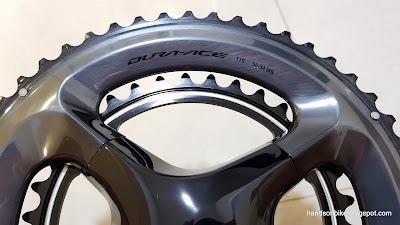 Dura-Ace 9000 chainring is 50/34T, with a silver outer ring ending in the silver coloured teeth. 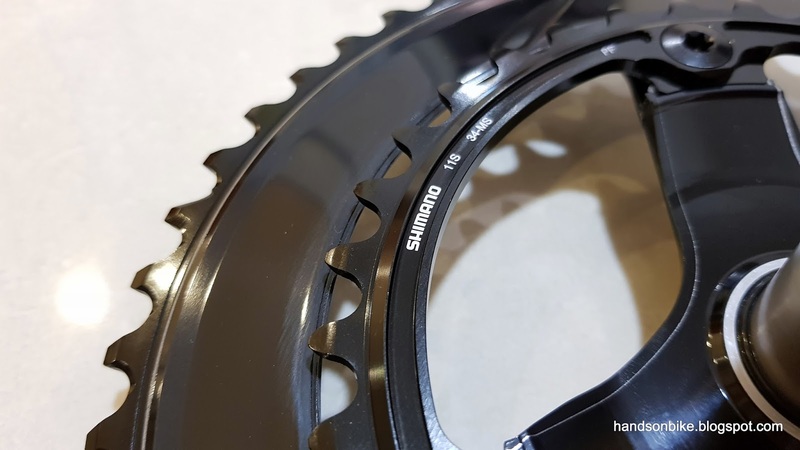 New chainring is light grey in colour, ending with the teeth that is also grey in colour. The colour on the teeth will quickly wear off and reveal the silver material colour once it is used. Inner chainring on 9000 crankset is quite ordinary, and the outer chainring also does not have many shifting ramps even though the shifting performance is good. 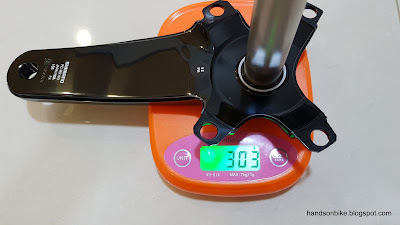 New R9100 right crankarm (165mm) is slightly lighter at 303 grams. It is much chunkier but also slightly shorter in length. 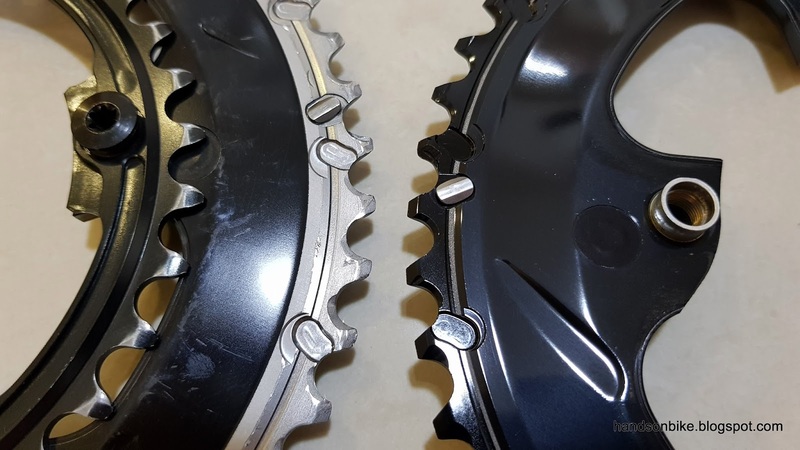 Comparing the chainrings side by side. 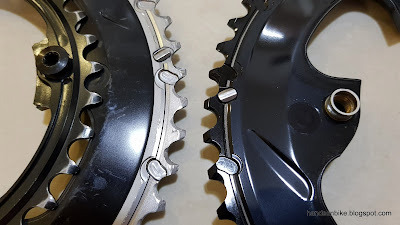 Both are 50/34T chainrings. 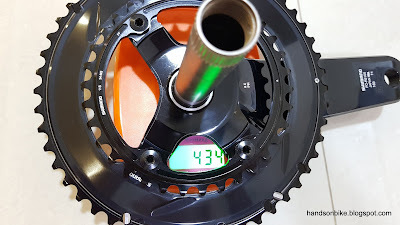 I wondered if the old chainring can fit onto the new crankarm, but found that it will not fit due to the different 4 arm profile. Rather interesting appearance though. 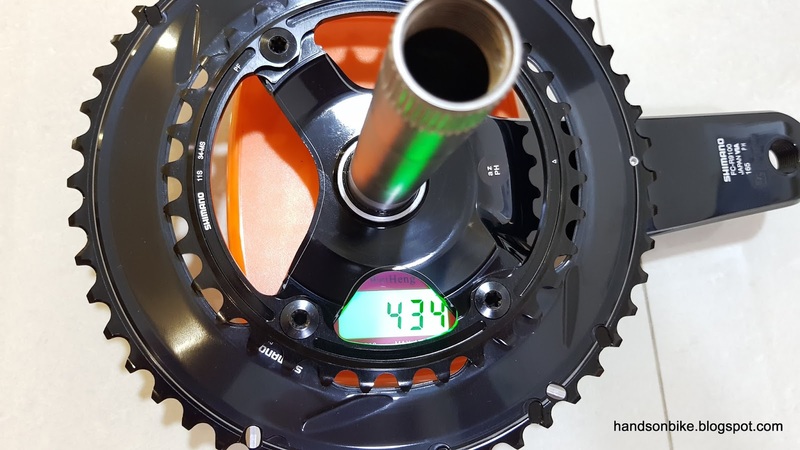 New R9100 series left crankarm weighs 175 grams, almost the same even though it is slightly shorter. 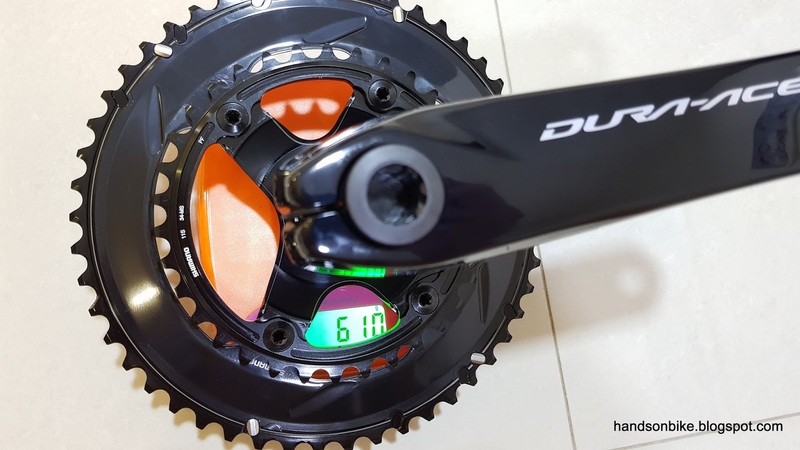 The new crankset is very slightly lighter in weight, probably due to the shorter 165mm length. However, the stiffness is reportedly improved on the right side due to the chunky 4 arm design that minimizes any flex. For me, I will not be able to produce that much power to induce any flex, so it probably does not make a difference to me. In summary, the R9100 crankset is more of an incremental improvement on the already excellent 9000 crankset. With the stiffer right crankarm, the stiffness is improved while the weight is maintained. All other aspects are mostly unchanged as far as I can see. 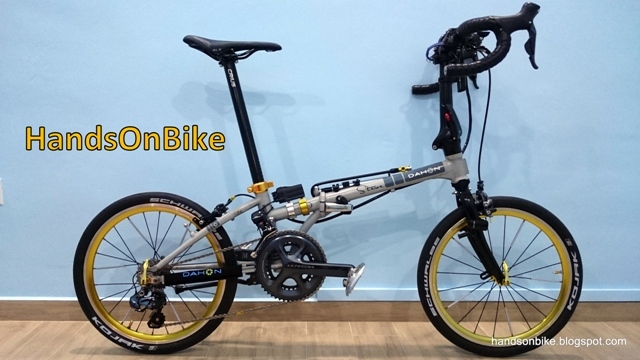 The new all black colour should be able to better match most bike frames, as compared to the 9000 series colour which did not match some bike frames in terms of colour. 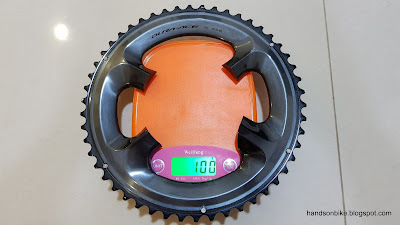 Can 9100 chainring fit 9000 crankset? 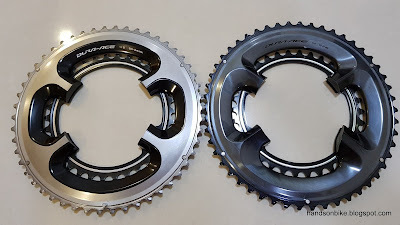 It might fit, but I cannot confirm it as I did not compare it the other way (R9100 chain ring on 9000 crankset). Is DA9000 crank better than Ultegra R8000 crank in terms of performance? In terms of shifting performance? Hard to say, as they all need to achieve the same level of shifting performance. 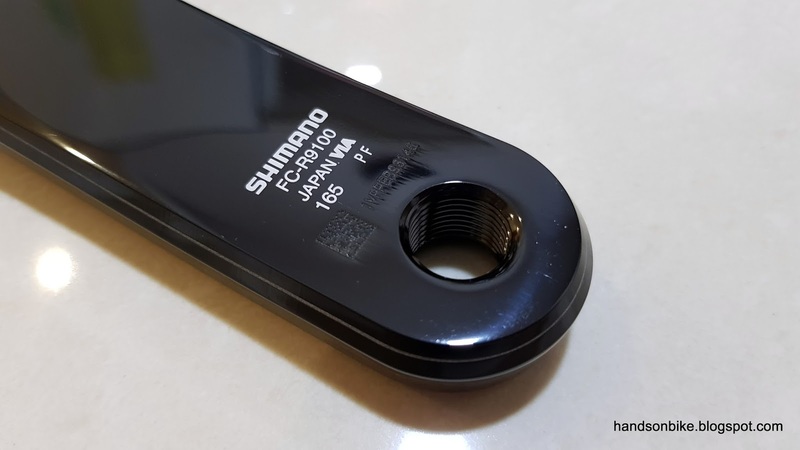 Shifting performance is also affected by other factors, such as usage of compatible/correct chain and front derailleur, plus correct setup and tuning (very important! ).